You attended a tradeshow and maybe even presented or sponsored an event, but how do you know whether you made a good investment for your staffing firm? Did you generate qualified leads to pass onto your recruiting and sales teams? Is this a show that you plan on attending again next year? In order to determine whether you are going to realize ROI from your staffing tradeshow, it is essential that you carefully assess the following factors. Don’t get sucked into making a bad investment by believing the industry hype. Even when a tradeshow has been deemed the best event for staffing firms like you, take the time to really investigate whether it is the right move for your firm. Are you paying for poor networking opportunities and generic content? Is your sponsorship money being used to pay for expensive guest speakers who are only there to impress the attendees? Is your staffing firm too small to be able to compete with the industry giants on the exhibit floor? Renting the smallest booth just to get your name on the vendor list is pointless if the fee blows your marketing budget out of the water for the entire year. 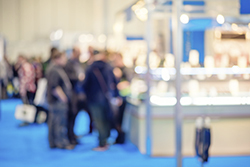 Tradeshow attendance brings the potential for extra added benefits that are sometimes difficult to measure. Establishing your firm as a thought leader by presenting, building your brand by hosting a networking event, and exposing your team to industry leaders and thought-provoking leadership sessions are hard to measure, but also invaluable to your staffing firm. Choose an eye-catching booth design that ties into your brand image, as that also increases your exposure and helps to get you noticed within your niche of the industry. In order to realize ROI from your staffing tradeshow, make sure you are taking advantage of these extra added benefits. Make use of a CRM to track leads and sales that are generated as a result of your tradeshow attendance. Provide your exhibitor staff with badge scanners that automatically upload information to your CRM. Collecting business cards or keeping a guest log at the booth? Make sure that the information is entered in a timely manner and that your recruiters are making contact according to your established timelines. Bring technology into your booth space with an interactive kiosk. In exchange for their contact information, enter attendees into a drawing for a cool giveaway. Whether you have already attended a conference or you are trying to figure out whether attending a particular conference makes sense for your staffing firm, the basic calculation you need to follow is (Gross Profit – Marketing Expenses) / Marketing Expenses. How much is it going to cost to reserve an exhibit space and ship your booth to the conference? What are the travel and accommodation expenses for your staff? Are you sponsoring or presenting? Don’t forget about the expenses involved in printing up your collateral and purchasing any giveaway items. Once you have added up all of these expenses, you must determine your potential or actual profit realized from the tradeshow. After the dust settles and your recruiters have returned to the office, your recruiters need to work hard to qualify leads, make conversions, close deals and realize ROI from your staffing tradeshow.